Burglary statistics all over Europe show how important alarm systems are for motorhomes, where travellers from Germany travel with their motorhomes. We offer you with our preventive camper alarm system a safe protection on all your travels. When developing the alarm system for the motorhome, the focus was on the signal effect BEFORE a burglar causes serious damage to your motorhome. This guarantees you a "future with security". This alarm system already works where conventional alarm systems do not even notice that a break-in should take place! The system works absolutely reliably. If the alarm sounds, there is someone in front of your vehicle. CaraWarn Secure-Sleep is a burglar alarm system for mobile homes and caravans - the special feature This alarm system is the unique specially developed preventive warning system - This alarm system Is designed specifically to prevent a burglary by possible potential burglars Detected and reported. A special sensor detects the area in front of the entrance door and signals Persons in front of the vehicle. A power LED is a source of intense light Burglar. The warning system is armed and activated on the alarm box as soon as you are pulled back in the vehicle Have or go to sleep. If a person or animal passes the vehicle, the system does not respond. Likewise, movements of bushes or leaves do not trigger an alarm by wind, with which a false alarm is virtually impossible. Only when someone approaches the door and stops in front of it, the alarm system responds by the power LED of the person before Of the door with intense flashing lights indicates that an alarm system is present. A burglar who was detected left in All rule immediately the vehicle, since he would like to remain unrecognized. Thus, this alarm system still provides for opening or destruction Of the door lock for a preventive defense measure. If it is only an animal, it is also quenched by the lightning Without triggering the main alarm. Only when the person lasts longer than 10 seconds before the door is the main alarm in the vehicle Triggered by a warning sound in the alarm box. This will awaken you in case of emergency and can react accordingly. Even If the intruder has not been quenched by the LED flashlight, this is caused by the movement in the vehicle in all probability To move away from his plan, because the burglar has no longer the surprise moment on his side and now in a not Predictable situation. 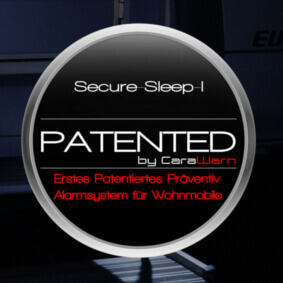 This patented warning system is unique in its function, and is especially designed for mobile homes and caravans to protect their occupants as much as possible in sleep BEFORE a break-in occurs. Many systems simply report a successful slump. This alarm system can actively prevent a burglary, thus protecting not only the vehicle itself from damage, but also protects you and your family as a victim from an attack in their sleep. An alarm system for the interior is a sensible addition, but firstly a burglary should be prevented as far as possible, thus optimally protecting your vehicle, your valuables and above all yourself. And exactly this can be CaraWarn Secure-Sleep. This alarm system is the only patented early warning system for mobile homes and caravans to protect the sleeping occupants. Other systems report only when the break-in has already occurred or the door has already been opened. As a rule, an expensive damage to the door or the door lock is already present, and in the worst case, you and your family will be surprised even in their sleep. Secure-Sleep has been developed specifically to alert you beforehand, thus actively protecting the occupants and actively preventing the damage to the door. The alarm systems for a motorhome should of course not only protect the motorhome, but also you as occupants, who spend many hours in it at night. In order to prevent a confrontation with burglars, who often also tend to violence, the caravan alarm system reacts with different signals. In our opinion, the alarm systems for motorhomes should not only react when the door is opened. That is why we have developed an LED flash which reacts when approaching the door. Such alarm systems for the motorhome always cause a reaction at the stranger, which takes as fast as possible distance from its project. The burglar does not expect a sudden thunderstorm of flashes from an LED lamp in the darkness and is frightened by it. The safety protection takes a U-turn. Without the alarm systems for motor homes, the occupants are always on the unsafe side. The alarm systems for the motorhome threaten to expose the planned crime by the occupants and persons from the immediate vicinity. Such alarm systems for motorhomes trigger a reaction of other campers or walkers and thus increase the protection for the occupants of the motorhome. If there is no escape reaction from the burglar within ten seconds of the LED flash, the burglar is put under further pressure by the start of the internal alarm. To protect his own identity, the burglar will flee. Does the CaraWarn alarm system replace a "normal alarm system" with door contacts or interior monitoring? The Secure-Sleep alarm system is a preventive system that protects you in your sleep and has been designed to actively prevent a burglary so that in the best case no damage occurs. This system is specifically designed to protect your family and your family during the night in the best possible way. "Normal alarm systems for motor homes and other vehicles" are usually activated when you leave the vehicle. You report only after an attempted burglary / burglary attempt and sometimes transmit a radio or app that has been broken into your vehicle and can at best prevent further damage. If you want to protect yourself against bad surprises in your sleep and prevent a possible break-in as far as possible, then the CaraWarn alarm system Secure-Sleep-1 is exactly the right alarm concept for your mobile home or your caravan. If you want to be informed that your car parked in your parked car, then you will not be able to offer Secure-Sleep by loud loudness or a push message on your mobile phone. In summary, you can say: Secure-Sleep protects you and your family and "standard alarm systems" can inform you better after a burglary. A parked motorhome is usually for burglars like "Freiwild". No alarm system can prevent 100% burglary! So you decide whether you want to be warned before or after a burglary ?! Many people are afraid of a gas attack at night. CaraWarn Secure-Sleep was developed to protect against such an attack at night. Police in France and Spain have found that 95% of all robberies occur through the construction door. The side door of the vehicle, even on newer models, can be opened quietly by professionals within a few minutes, so that the occupants can be surprised while they sleep and can also be partially anaesthetised by targeted gas attacks with a gas spray or a cloth soaked in anaesthetic gas. Gas attacks where an entire motorhome was filled with gas are not known according to the police and seem to have arisen purely from the imagination of the media. The amount of gas and the equipment required for this, as well as the physical knowledge of the exact division of the interior with partitions and curtains, make such an undertaking extremely costly and unlikely. Other forms of burglary detected for robbery at night are open windows or skylights, so that these should also be locked or separately secured as far as possible at night. A robbery at night, where the front vehicle doors such as the driver's door or passenger door were broken open, is not known in connection with a gas raid. All break-ins or damage to the driver's door or passenger door known to us are always pure break-ins if the vehicle has been left without occupants in a parking lot or parking space. A gas attack through the driver or front passenger door is unlikely because the seats, the curtain or even a lowered bed in the front room make it extremely difficult to enter and escape. A burglar wants to remain undetected and quickly flee again in case of danger. With the Secure-Sleep alarm system, essential protection at night and protection against a gas attack in the motorhome can be created. We can't promise you 100% protection, but you'll sleep more comfortably with Secure Sleep. Can the alarm system be activated even if I am not in the vehicle? Our alarm system for motorhomes can be easily retrofitted to an older camper. We supply you with the alarm system for your motorhome with detailed instructions for handling. With a basic technical understanding, you can install the alarm system yourself. If the installation should cause you difficulties, you can entrust the installation directly to a specialist workshop. In the case of alarm systems in the manufacturer's motorhome, therefore, always pay attention to the signal effects. If the existing concept is based on a signal effect if there is a burglar in the motorhome, this is insufficient protection. Have the caravan alarm system supplemented by our preventive system in a specialist workshop and thus secure your motorhome as well as yourself and your fellow travellers. Give especially children on the journey and while sleeping a safe feeling with an alarm system for your motorhome. If you have any questions about our motorhome alarm system, please do not hesitate to contact us. CaraWarn Secure-Sleep does not recognize false alarms. If the system has been installed correctly, the sensor is absolutely reliable and only reports when a person is in the sensor area. Rain or moving leaves are not reported. The system can run without batteries and all components are firmly connected, there can be no false alarms. If one of the cables is cut or the sensor is removed, the system will also sound an alarm as it detects and reports a sabotage alarm. The system is absolutely maintenance-free. Only the flash LED and the sensor should be cleaned of any contamination, which should be given by a normal vehicle wash. This system does not require any batteries and is supplied directly from its vehicle battery, which means that no empty batteries have to be exchanged or warnings for "battery status is low". CaraWarn already works where conventional systems do not even notice a break-in. Conventional alarm systems only report that your vehicle has been broken into after a break-in / attempted break-in and can at best prevent further damage.